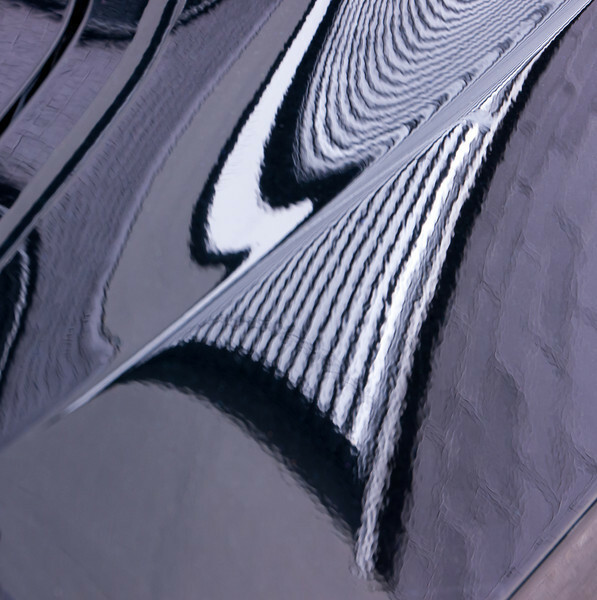 More reflections and distortions on car bodies are found in a new gallery and a slightly more extensive description was posted in an earlier text. Some of the photographers that I like and whose writing and photography I am following are filed (only in my brain) under different stereotypes (by which I identify them for example to my wife, who has to listen to my photography gibberish in length). Guy Tal is the philosopher photographer, even though this does of course not at all do justice to either his writing and much less his art (as no stereotype ever does). In fact, one of the first things that I read from Guy Tal was a rather technical ebook on Creative Digital Printing. Guy Tal is a very interesting person, thoughtful writer (check out his blog) and sensible observer that I have become to appreciate. He has a genuine attitude towards life and making a living and has been described as an artist, photographer or writer (teacher or philosopher could also be added) - in German I may have used the title Lebenskünstler, for which I have not found a satisfactory English translation (according to Leo, bohemien is a possibility that I quite like). Here, I would like to primarily mention Guy Tal's photography, which I think may be the tie for his passions and the main source for his wide acclaim. It is not the well-known and famous landmarks that are Guy Tal's motifs, but rather hidden gems of natural beauty that he finds on his treasure hunts in the Colorado plateau. Guy Tal's photographs, as well as his writing, convey an intense and personal relationship with the wilderness that is his home; they are truly intimate landscape photographs in the very sense of the word. Photograph © Guy Tal. Cottonwood in slickrock bowl from the Sandstone Worlds portfolio. While classical landscape photographs capture the vastness of the environment, intimate landscapes depict details from a close and personal angle. I do not feel qualified to describe, let alone define, intimate landscapes, but there are numerous essays including highly recommended articles by Guy Tal and many others (for example HERE or THERE; in addition I also like THIS text). Guy Tal beautifully describes intimate landscape photography as "... the artist’s attention to detail that allows them to expand their repertoire and find nuggets of beauty in practically any situation, with almost any subject and any light." Along the same line, the intimate landscape master William Neill (whom I have introduced in an earlier post) describes intimate landscapes as "little gems of nature (that) are lost without a conscious effort to slow down and to look for the picture within the larger picture." ... is whether to take a photograph at all! I am sorry for this overdone title. No decision concerning photography is REALLY important. However, for the pursuit of your passion, photography, pulling the trigger is an act with many implications. Photographs take up space on your memory card and computer and need to be transferred, evaluated, labelled, organized and developed. Eventually you likely want to publish or even print your oeuvre. If your life is just remotely similar to mine, time is scarce and it is challenging to keep up with all of these tasks (and many photography-unrelated ones; I contemplate petitioning for 48 hour days...). I assume that many of you face similar problems and would like to spend more time taking photographs and less time processing them. The solution is simple: Spend more time composing each photograph and take less versions of each photographs. The more photographs you take, the more time you will have to spend processing and comparing all your digital files. You can quickly take a gazillion of captures in a few superficial minutes with your motif (after all, your camera boasts 4.563 FPS) and then spend countless hours in front of the computer dealing with your prey. Alternatively, you could also slowly approach and inspect your subject from different angles before taking any photograph at all. Once you have contemplated and envisioned the final photograph, just one shutter release might suffice to capture the composition you want. The result: You interact much more intensely with your motif, spend more quality time with your camera and reduce the gigabytes of image files that you have to process. In addition, I am convinced that you will end up taking much better photographs. I would call this at least a triple-win situation! The digital revolution has dramatically changed the photographer's chores. When I started with photography, I used color slide film that was sent in for development and prints were arranged to be done by a lab of confidence. As a pupil, slide film was expensive and development and printing color slides myself was way beyond the possible. This past may explain my still enduring stinginess with slide film (ehhh, memory card space). Nowadays, memory card space is hardly limiting, photographs are recorded digitally, developed and printed out at home and published on the web. These developments open up endless possibilities but also raise the standards and demand a whole new set of skills that are largely unrelated to photography. Try not to get overwhelmed by them! A new project and gallery of mine. For more details have a look in THIS recent post. 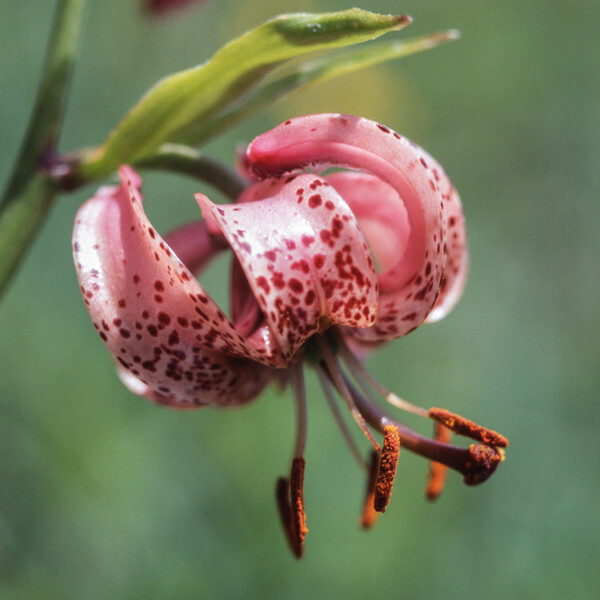 The Martagon lily (Türkenbund in German, Lis martagon in French, Lilium martagonin Latin) is a beautiful and conspicuous (when flowering) perennial plant that grows in valleys and mountains all the way from Europe to Asia. The flowers are pinkish to white with dark dots and effuse a sweet odor in the evening and at night in order to attract nocturnal pollinators such as the Hummingbird Hawk-moth. The Martagon lily is a protected plant and therefore you should most definitely not dig it up (only take photographs and leave nothing but footprints). However, if you bought bulbs of one of the martagon lily cultivars, you could admire their golden-yellowish color. In medieval times, miraculous curativeness was ascribed to these bulbs and alchemists used them to transform base metals into gold. Luckily this attempt was in vain and therefore we can still enjoy the sight of Martagon lilies in the wild. The origin of the name "martagon" seems dubious. It either refers to the Roman god of war Mars, who alchemists believed to have a hand in the transformation of metals, or originates from the Turkish word turban. Some types of this headdress come in shapes remotely similar to one of the Martagon lilie's flowers. In contrast, many (German) colloquial names of the Martagon lily (e.g. Goldapfel, Goldbölla, Goldknopf, Goldlilgen, Goldpfandl, Goldruabn, Goldwurzl, Goldzwifl, Poms d'or) refer to the golden bulbs and their origin is thus much less dubious. 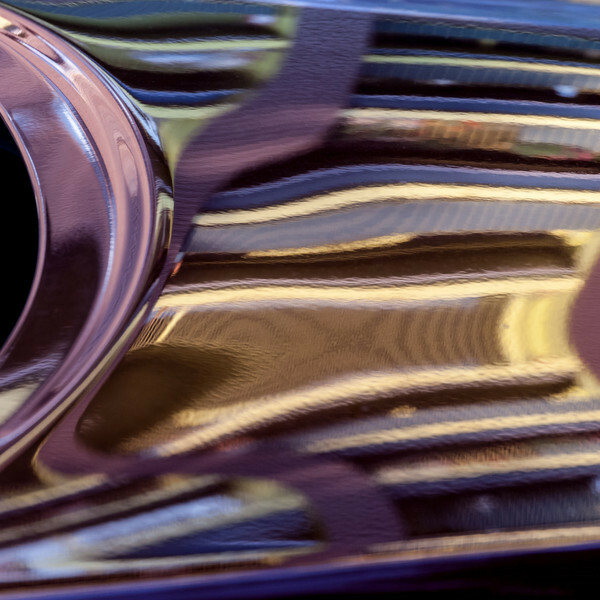 This summer, I have delved into a new project: abstract, colorful compositions that are found in the reflections and distortions on car bodies. 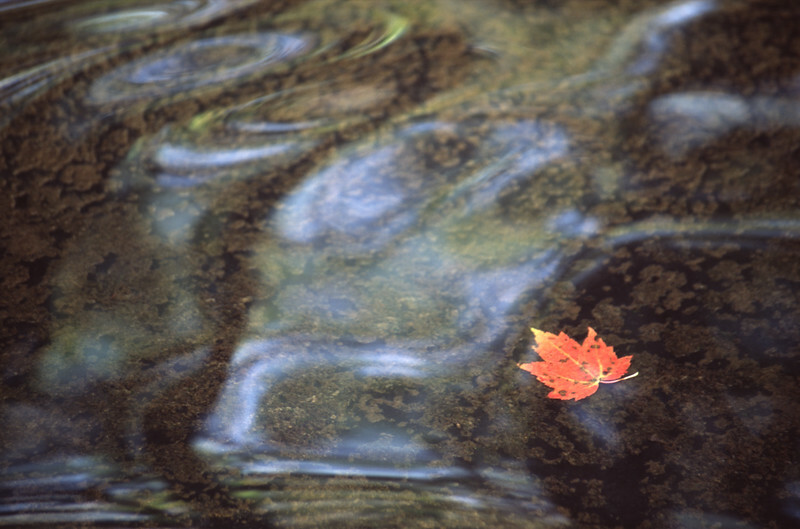 I have filed these photographs under the theme CARCOLORS. I have started this project because I am fascinated by how the slightest change of the viewing angle bends and distorts reflections on the curvy car body in unexpected ways. Depending on the lighting and point of view, the original color of the lacquering may be completely altered and the resulting photographs are a mélange of the colors and patterns in the surrounding. Such carcolor compositions may resemble abstract paintings or even details of nature (sometimes I am reminded of butterfly wings). Nevertheless, be assured that I only took photographs of plain-colored cars that I found in the streets of Oerlikon or elsewhere. The only bias is towards bright and shiny cars, which happen to be dark-colored more often than not. I am also still getting used to the astonishing "depth" of the carcolor reflections, which only reveals itself in close-up views and by focusing manually (in my experience autofocus is very unreliable for this kind of photographs). Here, I am showing you the first four photographs of this new project of mine. It is an ongoing work, like all of my projects, and I will try to document the growth of the carcolors gallery with "peeks" of newly added carcolor compositions. I hope you enjoy and wish you a nice weekend! In order to do justice to my name and to share my interest in nature and botany, I have started a Wildflower gallery. Here on my blog, I will show wildflower photographs and share links and interesting facts about different plants under the label Flora. The goal of these photographs is to package little bits of information into the accompanying notes of wildflower photographs. The photographs are therefore mostly documentary, but this does hopefully not prevent you from enjoying them. The first flower that I am featuring is a harbinger of spring - the Coltsfoot (Huflattich in German, le Tussilage in French, Tussilago farfara in Latin). It is hard to admit, but the French name is clearly the most fitting because it indicates that this plant has something to do with cough (the latin word tussis translates as cough). The leaves of Coltsfoot are one of the oldest medicinal plants and have been used for their antitussive and mucolytic powers (a very good German text is found here, an English text is there). Unfortunately, Coltsfoot also synthesizes chemical compounds (so called pyrrolizidine alkaloids) to defends itself against herbivores. These defense molecules are also toxic and carcinogenic for us if consumed in large doses (instructive texts are found HERE and HERE, links to more articles are listed on THIS page). Due to these health concerns, the commercial use of pyrrolizidine containing plants has been restricted or even banished in some countries. This, in turn, has stimulated research and lead to the discovery and in vitro propagation of pyrrolizidine-free Coltsfoot (a summary article in German is found HERE). 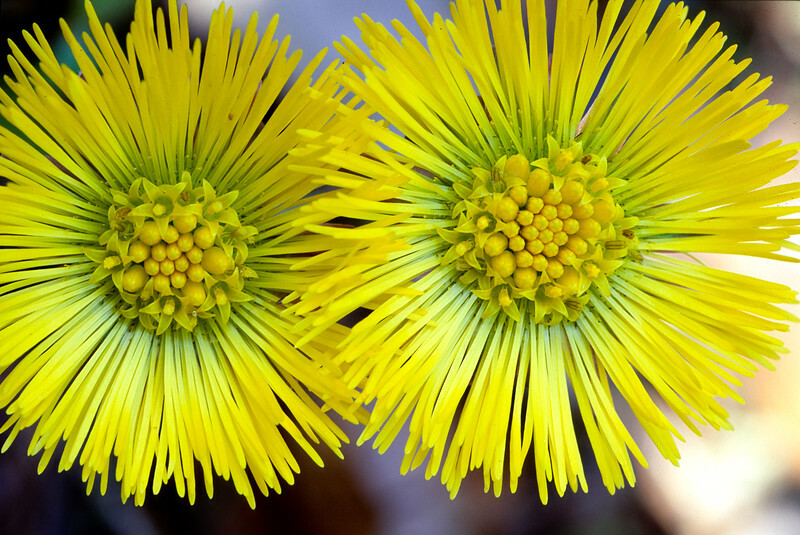 A less toxic but in certain situations more useful application of the wooly, hairy coltsfoot leaves is indicated by its colloquial name "hikers toilet paper." As long as its flowering, Coltsfoot is very easily recognizable. The Coltsfoot flowers are some of the first to appear in spring and they usually grow in disturbed, bare locations. However, since the medically relevant leaves appear only after flowering, fatal mix-ups can happen. Plants with similar leaves include the Butterbur (Petasites) or species of the genus Adenostyles, both of which contain more pyrrolizidines than Coltsfoot! To those of you living in Europe, Coltsfoot should be a common plant: it is widely distributed in Europe and Asia. However, it has also been introduced in North America. In the photograph above I particularly like how the two flowers intertwine and shine like two little suns; they almost look at you. The fifth peek into our staircase. What I like about this photograph is the brightly lit stripe of reflected light, which adds an eye-catcher to the (otherwise boring) light and shadow pattern. This phenomenon can only be observed during a short time of the year and only on sunny evenings. 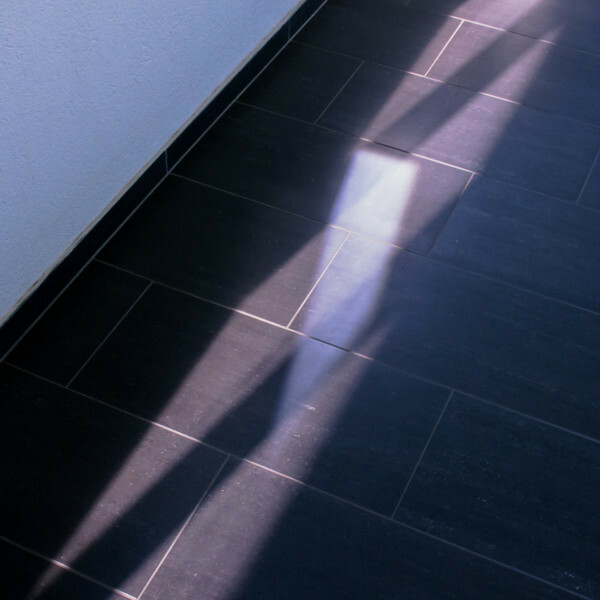 If you are interested in other light and shadow views that were observed right in front of our entrance door, have a look at the photographs in the light teeth, staircase light stripes, staircase light and shadow or staircase impression 4 posts.